It’s hard to feel like yourself when you’ve got a drooping brow. On any given moment, a drooping brow can make you look sad, angry, and tired, even if you feel perfectly fine. What’s worse is that a drooping brow is often accompanied by a wrinkled forehead that can make you look much older than you really feel. Our brows sag because, after decades of aging, our skin loses its tight, elastic qualities. While our brows normally sit on the upper boundaries of the eye socket, a sagging forehead can cause the eyebrows to droop down farther or flatten in appearance. You’re a vibrant person—don’t let a drooping brow obscure that. If you’re ready to reveal your livelier side, then a brow lift will be able to help you. A brow lift can lift sagging brows, smooth a wrinkled forehead, and help you achieve a more refreshed appearance. By lifting excess skin on the forehead and repositioning the brows, the brow lift can target a myriad of signs of aging; it can restore the arch to a flattened brow, prevent your eyes from being obscured, and smooth out a deeply wrinkled forehead. Who Is a Candidate for the Brow Lift? Dr. Machida performs two different techniques for his brow lift: the traditional brow lift and the lateral brow lift. 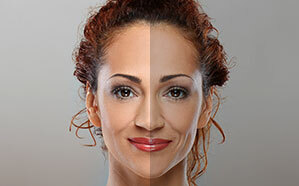 During your consultation, Dr. Machida will thoroughly analyze your facial anatomy and brow line to determine which technique to use. Both techniques will be performed using local anesthesia, and each can be performed in Dr. Machida’s private surgical center. Because he finds it the most effective brow lift, Dr. Machida performs the direct brow lift the most often. In a direct brow lift, Dr. Machida will make an incision at the top of the eyebrows. Then, he’ll lift the forehead skin and its underlying tissues. He’ll also remove any excess skin and fat to make sure the brows look as aesthetically pleasing as possible. The eyebrows will be tightened and sutured into a more youthful position. After the direct brow lift, any scarring from the incision will be hidden by the eyebrows. In a traditional brow lift, Dr. Machida will make an incision behind or along the hairline. Then, he’ll lift the forehead skin and its underlying tissues. He’ll also remove any excess skin and fat to make sure the brows look as aesthetically pleasing as possible. The forehead will be tightened and sutured into a more youthful position. After the brow lift, any scarring from the incision will be hidden by the hairline. Sometimes, a patient only needs to lift the outer portion of their brows. In that case, a lateral brow lift might be more apt. In a lateral brow lift, an incision will be made on the temples near the hairline. Then, Dr. Machida will elevate the outer edge of the brows. The lateral brow lift is minimally invasive and has a shorter recovery time than a traditional brow lift. If the patient wants, the lateral brow lift can be easily combined with other surgical procedures like facelift surgery. Can I Combine the Brow Lift with Other Procedures? The brow lift can be easily combined with other procedures like eyelid surgery, facelift surgery, and injectables. How Do I Determine If I Need a Brow Lift or Eyelid Surgery? You can perform a quick-and-easy test to determine if a brow lift or blepharoplasty is right for you. First, while looking in the mirror, use your fingers to lift up your brows until they look normal in appearance. Make sure you’re not making yourself look too surprised. If this lifts most of the skin around your upper eyelid, then a brow lift may be adequate to rejuvenate your face. If there is still excess skin around your eyes after you lift your brows, you may need eyelid surgery, too. 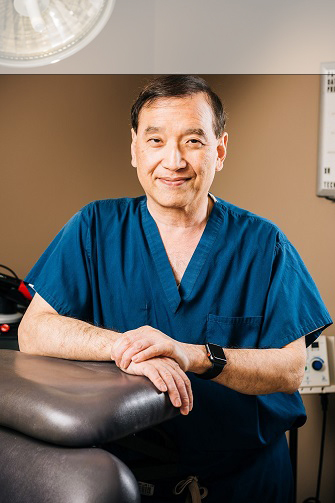 During your consultation, Dr. Machida can help you decide which procedures you need. What’s the Recovery Like After a Brow Lift? Patients will be able to go home immediately after their brow lift. During their recovery, many of our patients will experience some level of soreness, swelling, and discomfort. After a traditional brow lift, patients typically have some numbness around the incision sites for several months. Patients are asked to sleep on their back and keep their head elevated for the first week of their recovery. Patients should also expect to take a week off from work to recover from the brow lift. There is a somewhat quicker recovery if you undergo a lateral brow lift, but it’s best to have Dr. Machida clear you before returning to your work or daily activities.